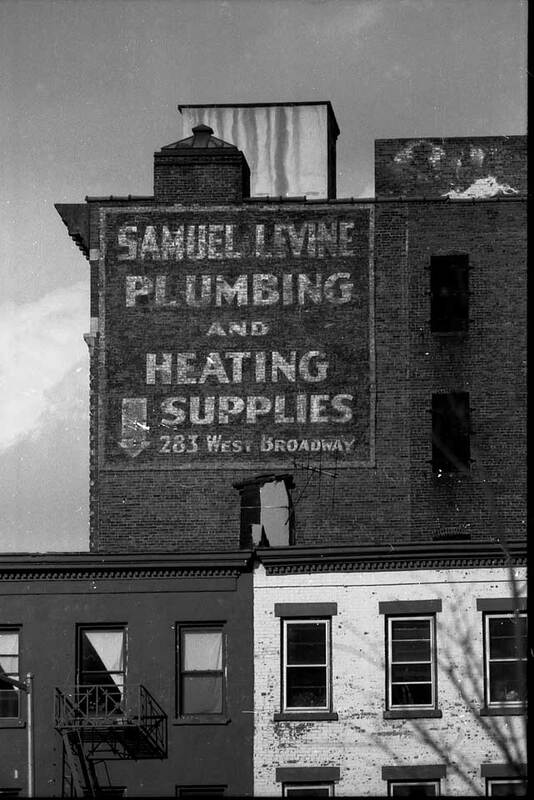 Samuel Levine Plumbing and Heating Supplies at 283 West Broadway was listed in the New York (Manhattan) telephone directory from 1950 to 2004. The business is currently (2016) on the internet as Samuel Levine Plumbing and Heating Supplies located at 151 Horton Ave., Lynbrook, NY, 11563-2330. This company's origins go back to 1922, when Samuel Levine (1889-1968?) left his employer, A. Shapiro Plumbing Supply Co., and formed his own business at 257 3rd Avenue. As reported in Domestic Engineering, 5 August 1922, pg. 243, "Samuel Levine, formerly with the A. Shapiro Plumbing Supply Co., Inc., New York City, is making arrangements to open a plumbing and heating specialty business at 257 Third Avenue, between Twentieth and Twenty-first Streets, in New York City, on or about September 1, 1922." The founder registered for the World War I draft in 1917 as Samuel Levine, age 28, born 27 January 1889, Waskonsk?, Grodna, Russia, manager A. Shapiro & Co., 167 Avenue A, New York, NY. His 1942 registration gave this as "born Wolkowisk, Russia," in business for himself at 247 3rd Ave. NYC. Levine appears in several census reports, including the 1940 U. S. Census, when he was 51 years old, born Russia, living at 276 Riverside Drive. Samuel Levine was succeeded in the business by his son, Aaron Levine (1925-2015). The following appeared in the New York Times, 12 Jan 2015, "Levine - Aaron "Buddy". March 18, 1925 - January 9, 2015. Beloved husband, father, grandfather and uncle. First lieutenant in the US Army Air Corps Bombardier in the Pacific theater in WWII. President of Samuel Levine plumbing and heating supplies inc for over 50 years. Former trustee of the village of Russell Gardens. Resident of Great Neck, NY and Delray Beach, FL. A compassionate beloved trusted friend to all, who enjoyed travel, dining, card playing, reading, dancing and a zest for life. Everyone loved him. He is survived by wife Sandy of 63 years, son Larry and wife Susan, grandchildren Ben Ivy and Jamie. Predeceased by son Bruce. Funeral services at Riverside Nassau North Chapels, Great Neck NY, Tuesday, January 13, 2015, 10:30am." The company began on 3rd Ave. in 1922 and occupied 283 West Broadway from 1950 until 2004/2005. They were then located in Lynbrook, NY, on Long Island. The internet now (2016) lists them at 151 Horton Ave. Lynbrook, NY 11563-2330. Samuel Levine Plumbing and Heating Supplies was not your typical neighborhood plumbing supply house. They specialized in wholesale materials for large corporate projects and for government contracts. The website http://www.governmentcontractswon.com lists 1251 government contracts for $18,343,040 awarded over the years 2000 to 2014. Levine's earlier employer was A. Shapiro Plumbing Supply Co., located at 167 Avenue A, New York City, from 1910 to 1982. Their founder was Adolph Shapiro (1872-1922). Shortly after Shapiro's death the following appeared in The Plumbers Trade Journal, 1 Dec. 1922, "Although handicapped by the death of the President, Adolph Shapiro, the firm of Shapiro Plumbing Supply Co., Inc., New York City, is continuing to increase its already large volume of business. This is in great measure due to the fact that the established policies of the late Mr. Shapiro in handling only the best grades of materials and in making prompt deliveries have been strictly adhered to. At the present time this firm is supplying the materials for 22 one-family houses which are being erected in Bellaire, L. I. The shipping department of this progressive supply company is equipped to make deliveries throughout Long Island and the Metropolitan District." This view of the Samuel Levine sign was taken in 2001. This view of the Samuel Levine sign was taken in 2005.